Washington, D.C. – According to the latest America Saves Personal Savings Index, the perceived interest, effort, and effectiveness of Americans to save money declined in the last year, and savings effort and effectiveness are at a three-year low. Declines for low- and moderate-income Americans have been especially steep. 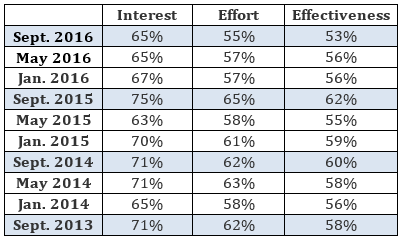 As the table below shows, in the past year the three key savings indicators have declined – savings interest from 75 percent to 65 percent, savings effort from 65 percent to 55 percent, and savings effectiveness from 62 percent to 53 percent. Moreover, savings interest, effort, and effectiveness are now considerably lower than they were in the three previous Septembers – 2013, 2014, and 2015. However, as the table below indicates, to a large extent these declines reflect large losses experienced by low- and moderate-income Americans. For those with incomes under $25,000, in the past year declines in the three indicators were either 15 or 16 percentage points. For those with incomes $25,000-$50,000, these declines were either 13 or 15 percentage points. Yet, for those with incomes $100,000 or more, declines were much more modest or nonexistent – five percentage points for interest, four percentage points for effort, and nothing for effectiveness. In both September 2015 and September 2016, for the high-income group, savings effectiveness remained at 71 percent. Moreover, for those with incomes between $75,000 and $100,000, during the past year savings effectiveness increased from 62 percent to 64 percent. “The economic inequality in our society is reflected in our savings statistics,” noted Stephen Brobeck, Consumer Federation of America’s Executive Director and a founder of America Saves. “The economic recovery, particularly the increase in housing prices and buoyant stock market, have especially benefited middle and upper income groups,” he added. All PSI surveys have shown a strong correlation between income and the savings indicators reflecting the fact, mainly, that the higher one’s income, the easier it is to save. The Personal Savings Index is based on surveys undertaken for America Saves by ORC International, which surveyed a representational sample of over 1,000 adult Americans by cell phone and landline. 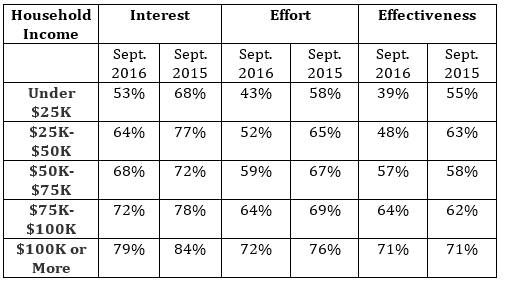 Respondents were asked to respond to the three questions about interest, effort, and effectiveness on a 10-point scale ranging from “no interest” to “great interest,” and these responses were converted into percentages. The latest interviews were conducted September 8-11, 2016. The survey’s margin of error is plus or minus three percentage points.